For true fans of bubbles, cocktails, and beer, the best way to imbibe is to mix or pour a drink at your own personal bar. After all, why feel obliged to trudge to a crowded pub when you’ve got a relaxing respite at home? 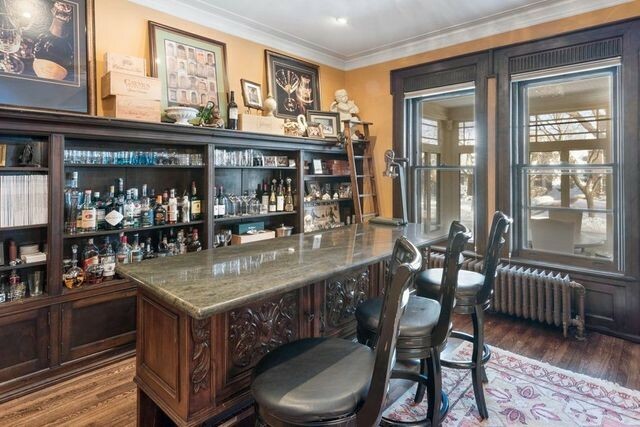 And when we talk about a home bar, we’re not referring to a kitchen island with a few dingy, mismatched beer mugs. We mean bar stools, storage for bottles of wine or spirits, perhaps even taps for beer. Nice glassware organized and within reach. Hosts will find this amenity turns their home into an enticing pad for inviting family and friends over to watch the game, kick back for happy hour, or wile away the winter months indoors. It can be a sleek ’70s-style built-in with tons of tufted leather and wood paneling. Or an old world–style pub with amazing craftsmanship. From Milwaukee to Los Angeles—and spots in between—here are seven home bars worth toasting. Cheers! Guzzle like a Gatsby: Close to Lake Michigan’s shoreline on Milwaukee’s East Side, this five-bedroom Victorian/Federal style home was built in 1904. If you’re a fan of 1920s-style decor—which could lead to killer flapper parties—this home bar might be your dream. There are three stools in front of a carved-wood bar and ample shelving behind the bar for your favorite liqueurs, Bordeaux wine crates, and the perfect glass for each drink. 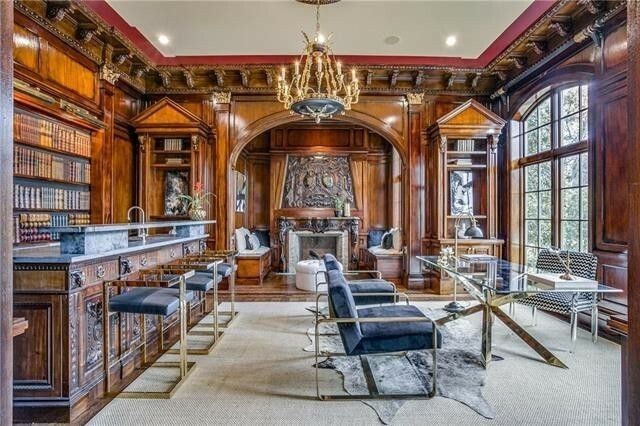 Pour an Old-Fashioned cocktail: Tucked into the tony Highland Park suburb, this 9,281-square-foot mansion looks historic, but was actually built in 2007. 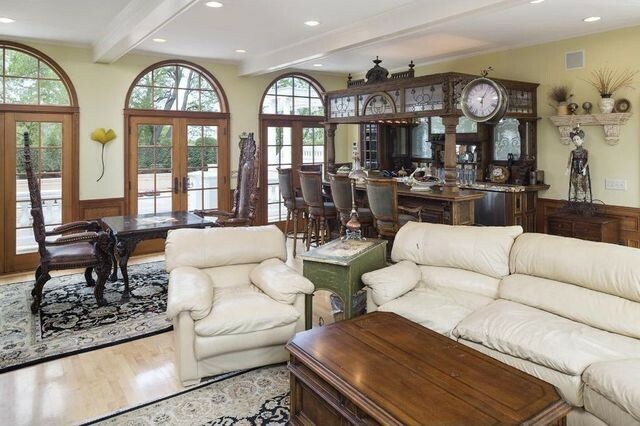 The wood-paneled bar featuring chrome bar stools, arched windows, built-in bookshelves, and carved crown molding is a sumptuous hideaway ideal for entertaining VIPs or indulging in your bar owner fantasies. Après-ski sipping: This mansion is replete with luxuries—including the home bar with three bar-height chairs, a granite countertop, wine fridge, and glass-walled shelves. 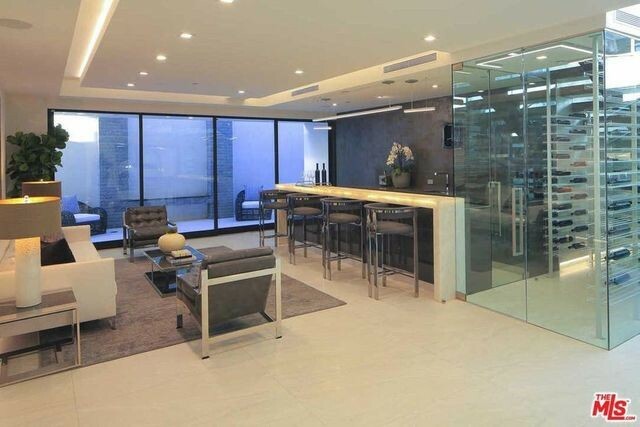 Additional space in the bar area allows for seating or perhaps a billiard table to up the entertainment factor. High atop Red Mountain, the 6-acre property includes an 18,000-square-foot main house and a 4,000-square-foot guesthouse. 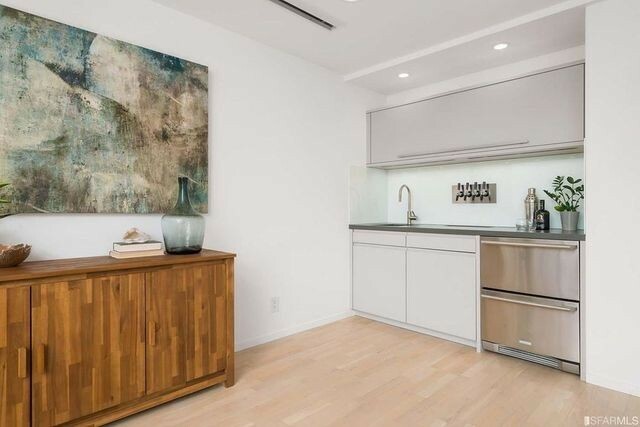 Cheers to the city: This newly renovated three-bedroom, three-bath home in the Parkside neighborhood is perfect for craft beer enthusiasts—just check out those built-in taps! Caesarstone countertops, a Wolf range, and a Sub-Zero fridge in the kitchen have helped transform this 2,553-square-foot home—built in 1938—into a sweet entertaining pad. Pour a pint: Looking for a spot to host the best St. Paddy’s Day party ever? Built in 1903, this mansion in the Lowry Hill neighborhood is March 17, 2020, goals. Look at that Irish-style pub! With eight bedrooms and 14 baths—divided between the main house and a guest apartment—plus a seven-car garage, there’s certainly room for guests to crash overnight. Come summer, an outdoor pool and cabana offer more space to a raise a glass. Vertical tastings with views: With a wall of windows, a glass-walled cellar holding 430 bottles, and a marble countertop, the home bar within this 11,695-square-foot home in Bel Air is the place to be. Seven bedrooms offer plenty of guest space in this brand-new home overlooking the Getty Center and the Pacific Ocean. A swim-up bar in the infinity pool is also the ideal perk for outdoor entertaining. Imagine the glam parties you’ll host. Meet me in St. Louis: A wine bar, pool, and built-in bar are just three of the amenities in this mansion suited for entertaining. 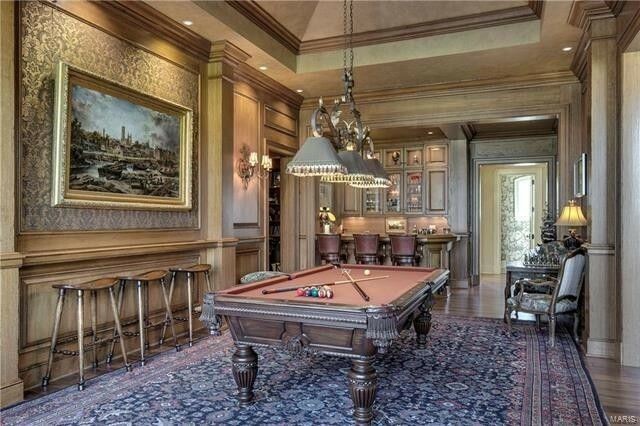 Within the bar space is enough room to—as the current owners do—have a billiard table and hang artwork. Two built-in bars—with enough room for three bar stools each—are joined by custom shelving and cabinetry to store spirits and glassware.